Dozens of Israeli soldiers, accompanying several colonialist settlers’ buses, invaded the northern West Bank city of Nablus, at dawn Wednesday, heading to “Joseph’s Tomb” area, before the soldiers attacked dozens of Palestinian protesters, wounding at least ten. 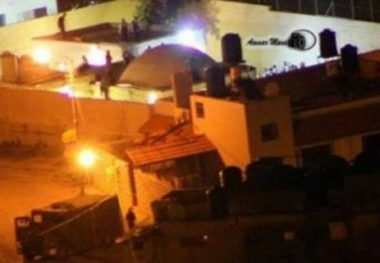 Media sources in Nablus said the soldiers invaded the eastern area of the city, to accompany the colonists into the site, after closing the surrounding Palestinian areas. They added that dozens of youngsters hurled stones at the invading vehicles, while the soldiers fired live rounds, rubber-coated steel bullets and gas bombs. Two Palestinians, including a journalist identified as Mo’tasem Saqfelheit, were shot with rubber-coated steel bullets, and were rushed to Rafidia Hospital. Eight other Palestinians suffered the severe effects of teargas inhalation and received the needed treatment by local medics. Joseph’s Tomb is revered by Jews, Muslims, Christians and Samaritans, and the Israeli military allows Jews to visit as part of organized pilgrimages, despite the shrine being in an area under control by the Palestinian Authority. Palestinians generally hold that the tomb is the funerary monument to Sheikh Yousef Dweikat, a local religious figure.